This study introduces a new dataset of bilateral value added trade costs for the goods and services sectors, based on a measure derived from the micro-founded gravity model and using data from the OECD-WTO TiVA database. 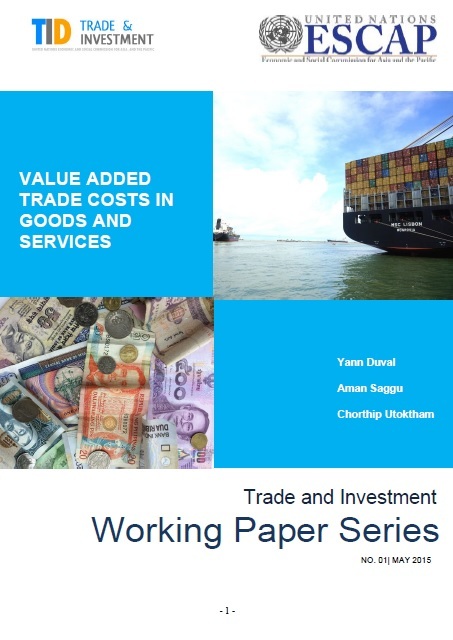 This is the first study to calculate value added trade costs for a set of developed and developing economies, both for the goods and services sectors. Overall, we find that, in the goods sector and in absolute term, international trade costs calculated using value added data are lower than those calculated using gross trade and output data. However, in relative term, bilateral trade costs remain broadly similar regardless of the trade data employed, with trade costs of Republic of Korea and Malaysia consistently outperforming all other developing countries – as well as most developed countries – included in the dataset. Value added trade costs are declining over time across most countries and regional groups and integration into global supply chains and production networks is found to be clearly associated with lower value added trade costs. The agricultural sector is characterised by substantially higher trade costs than in both manufacturing and services sectors. In turn, value added trade costs are found to be slightly higher in services than in manufacturing, although substantial cross-country heterogeneity is observed at the sub-sectoral level.